Ever dreamed of opening up your own toll booth on some busy Interstate highway? Although not an interstate highway, this was an enterprising fundraiser that was seen in the quaint Western Massachusetts town of Lee. Several volunteers wearing brightly colored safety clothing were standing in the middle of the road on their town’s Main Street. Strategically placed signs announced a “toll booth ahead” and a line of cars were waiting to pay. Most were probably also wondering why there was a toll booth in the middle of Main Street in a small tourist town. As drivers got closer, they realized that the toll booth was a fundraiser for the local school baseball team. Interestingly, however, most of the cars were plunking coins and dollar bills into the volunteers’ collection cans. The key for running this fundraiser is to get the police department (and probably the mayor) of your town to go along. Perhaps their biggest concern will be around the safety of the volunteers, as well as the unsuspecting drivers who were coming upon the traffic congestion. As it was pretty easy to drive around the cars that were stopped, it didn’t tie up traffic that badly, but plenty of cars were stopping and donating with a smile on their face. You’ll probably need to have a few alternative scenarios available if your town views this as a safety hazard. Perhaps you can set up near the sidewalk area, instead of in the middle of the road. With the help of some volunteers to wave the cars over to your toll booth area, you can probably keep the traffic from snarling up. You will probably increase your chances of being able to do this fundraiser if your town’s mayor or police chief has a connection to your cause. If they do, by all means use that leverage to get their approval. Another approach would be to ask a mall to let you set up in front of their main entrance. The best time to do this type of fundraiser is on a Saturday or Sunday when people are not in a rush to get to work on time. The best area is probably where traffic generally moves fairly slowly, as that increases the chances of someone actually handing you money. It also increases your volunteers’ safety. 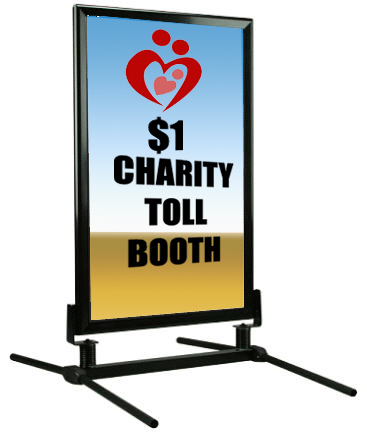 Make sure you suggest a donation amount ahead of the toll booth, so that drivers will have their money ready. If you can get the town to go along with placing a replica of a toll booth in the center of the street, you will probably increase your success and your volunteers’ safety. If the town won’t go for the toll booth in the road, you might want to find a busy sidewalk and try the toll booth concept there. The fundraiser in Lee didn’t use a booth. You should also have plenty of brochures on hand, as well as a way for people to contribute more at a later time. If you can tie this event to an upcoming event, such as presenting your toll receipt and getting a discount on admission, you will score a double hit. Source of Idea: Lee, Massachusetts, as described in the above write-up.